This is picture of my morning cup of coffee. I tried to add a little sugar but dropped the packet in by accident. It floated for a moment, then sunk to the depths before I could save it. I had just taken the trash out, so I couldn't follow up on my first impulse to plunge my hand in after it. 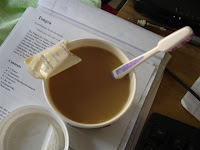 In the minute it took for me to go wash my hands and find a fishing implement (my toothbrush), the packet melted open and all the sugar seeped out. So mission accomplished after all, I suppose. But by then the coffee had cooled, and I kept imagining that it tasted...grainier...somehow, and the end result was a wholly unsatisfying morning cup of coffee. I'll try again later, when I'm more awake, and not so hung over. One should try to go to sleep before 2 a.m., especially on school nights. One never needs the better part of a bottle of Two-Buck Chuck to accompany Valentine's Day. One should always keep a pair of chopsticks handy. Maybe in one's pen basket. One probably doesn't need sugar in one's coffee anyway.